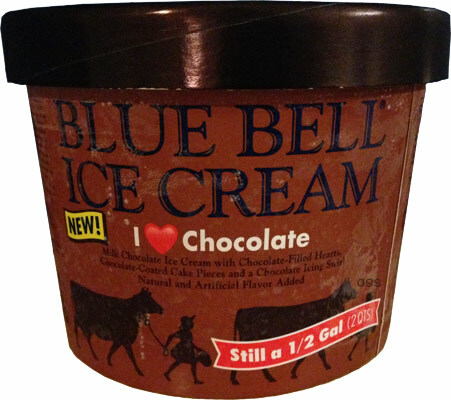 [by CT, New for 2014] Blue Bell has released a new limited flavor which appears to coincide with Valentine's Day. This flavor is called "I ♥ Chocolate" and is aimed at people who like to turn their chocolate consumption up to 11 (people like my wife, for example). It uses milk chocolate ice cream as the base and then mixes in chocolate filled hearts, chocolate coated cake pieces and a chocolate icing swirl. I do ♥ chocolate, but I think too much can be overkill so I was a little worried about whether or not I would like this flavor. The first time I tried it, I was pleasantly surprised and really thought this flavor was well-executed. The two harder mix-ins were great. The candy and cake piece were all about the same size, which I would estimate to be around the same size as a standard jelly bean. They were spread out fairly evenly such that it was more common to get a bite with one or the other than it was neither or both. It was hard trying to decide which I liked better, getting a bite with the cake or a bite with the candy. The cake was soft with a dense texture (reminded me of a Little Debbie Cosmic Brownie, but better tasting). The chocolate covered chocolate candy pieces were rich and also soft rather than hardening up too much in the cold. Subsequent servings left me feeling like this could have been better though as there were ultimately slight downsides, too. My first issue with it was the base ice cream flavor. This chocolate flavor was not something that I would choose on it's own if there were no mix-ins. 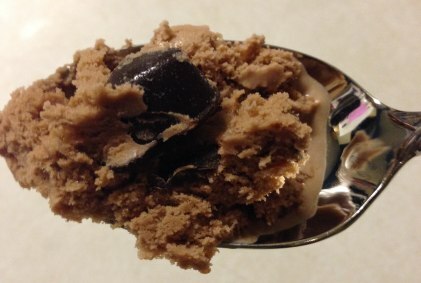 It just seemed sort of plain and almost more along the lines of a fudgecicle in it's flavor. Something like this, I was expecting a super rich, chocolatey base. What could have helped accent this was the chocolate icing swirl, but it didn't seem to be much of a factor. In fact, I had forgotten it was a part of this until re-reading the press release. Maybe a frozen chocolate icing swirl is too similar to chocolate ice cream and thus didn't stand out. I think I would rather have had a saucier fudge swirl and more of it in the container. With these two weaknesses, the whole package didn't seem to come together like I was hoping. As it is, it's enjoyable, but lacking. I'm not saying I would never get this again, but if given a choice, I'd probably go with another Blue Bell flavor over this one. And by "if given a choice" I mean, I'm pretty sure that this is all that my wife will allow us to buy until the limited time is over. 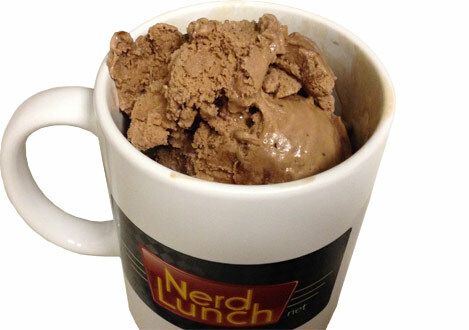 Note: You can hear CT on the Nerd Lunch Podcast weekly available from iTunes and Stitcher. The reality is that Blue Bell's rich milk chocolate base (yes) is generally viewed as one of their strengths. Where they usually fall short is the mix-ins. Having just eaten this pint myself, I can say without any reservations that this flavor rectifies that problem and then some. It's actually one of their best. Also, I had no difficulty distinguishing between the flavor of the ice cream itself and the mix-ins. I have to seriously question whether someone who didn't like this should really be reviewing anything chocolate or ice cream. There's nothing at all complicated going on here; it's just a very well-executed chocolate ice cream with chocolate mix-ins. As someone who has long felt that Blue Bell sometimes stops short of being what they may view as "too decadent," it's quite disheartening to see them getting slagged in an instance where they've really hit the nail on the head. Thank you for the thorough comment, but I wouldn't consider this a slagging, he enjoyed the ice cream and takes the time to point out that his wife loves it (something I often do as well). Instead, I consider this a thoughtful second scooping of an entire half gallon container (as opposed to devouring a single pint). I read this review as "dont go in to this expecting the chocolate overload of say B&J's chocolate therapy despite it being called I love chocolate". I agree with the reviewer. 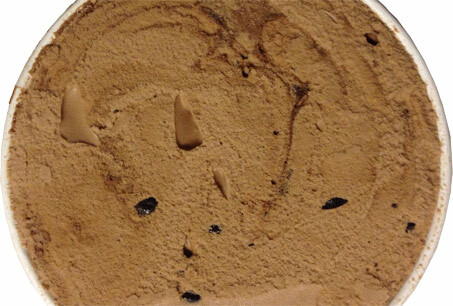 The base of this ice cream reminded me of frozen chocolate milk. It had a very milky taste and almost an icy feel. I think fudgesicle was a perfect comparison. Halfway through the half gallon, I started picking out the mix-ins and eating them on their own. This looks so good! I really wish Blue Bell was sold in my area. To the commenter above, I've been doing the same thing! I'm tossing the bites without a mix in down the drain. I probably wouldn't buy again but the mix ins are yummy! My all time favorite Blue Bell flavor is still Triple Chocolate: Dutch chocolate, milk chocolate & homemade vanilla ice creams swirled together with chocolate sundae sauce. The runner up would have to be Banana Pudding.